A certificate of achievement has such a high degree of satisfaction that its relevance in any institution cannot be overemphasized. Every single person has something that they can be recognized for, be it a positive change in habit or an improvement in academic performance etc. Some may argue for the case of naughty students in class or learning institutions who may have nothing to be recognized for. The truth is, even such students have something that they do that deserves mention and recognition. 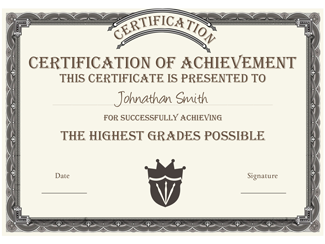 The value of a certificate of achievement spans a number of institutions both academic and non academic. 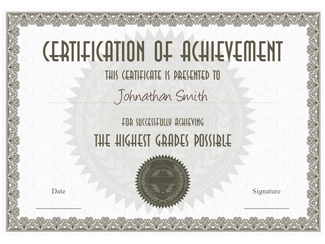 In school setups, certificates of achievements play a major role in enhancing the performance of students. Recognition by its nature lifts and supports the morale of students. Teachers should thus ensure that they recognize their students for the various achievements be it academic or for other co-curriculum activities. This will go along a way to help the students explore the fields they are talented in. In some schools however, they only focus on the academic side and neglect the non-academic side. This might have adverse effects on students who do not excel in class but they are very good in drama, theater, athletics and ball games. By just appreciating a student for being the best in a contest might have a long lasting effect in the young person’s mind. This helps to build him up to face even tougher situations later in life. One may be gifted in a particular field but may shy away if in the past they did something that was not appreciated after putting much effort. In the corporate arena employees appreciate when they are recognized by their employers. This boosts their morale to put more effort to propel the organization to another higher level. A certificate of achievement can give an employee the momentum that will make him go out of his way to ensure that he meets the company’s set goals and objectives. Recognition has a way of naturally boosting someone’s self esteem and confidence. Some people struggle with their past since they faced rejection when they were growing up either from parents, age mates or neighbors. By recognizing their achievements one can thus restore the lost self esteem. Young people especially love it when you show them compassion and acknowledge them when they make an achievement. People of all walks of life appreciate certificates of achievement since it serves as a beacon of value. This gives them new impetus and zeal to carry on. Young professionals especially fresh graduates need to be acknowledged occasionally to build their confidence in the work assigned. 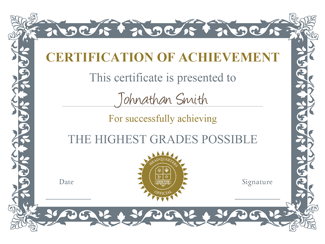 Certificates can be given after completing an assigned work successfully more so if it is the first assignment; when the work has been done in an outstanding way or by doing something remarkable out of your assigned responsibilities. Certificate of achievements can be issued monthly, semi-annually or annually depending on the settings of the organization. To underpin the significance of a certificate of achievement in enhancing career progression, most employees and awardees tend to use these valued documents in securing employment in other establishments. 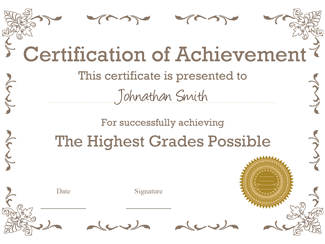 To the old and young alike, a certificate of achievement serves as a gold nugget which they closely guard throughout their lifetime.